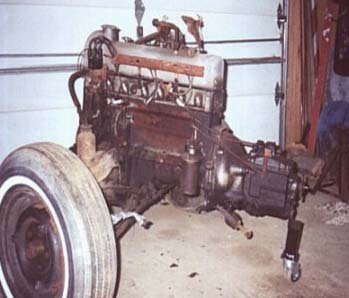 When I was faced with restoring my 1955 Mercedes-Benz Type 220a Ponton sedan from the ground up, I decided to remove the sub-frame, engine and transmission as a unit rather than in pieces, so as to facilitate front end work. Not knowing if my friendly Mercedes-Benz dealer would have this special tool to lend out, I decided to build the sub-frame castor assembly using materials from my scrap pile. I managed to build a functional tool, albeit not as pretty a piece as is shown in the manuals. b. Square stock 2" x 2"
c. steel plate 2-3/4" x 3-3/4" x 1/8"
While the materials you choose to use can vary greatly, two specifications should remain constant. 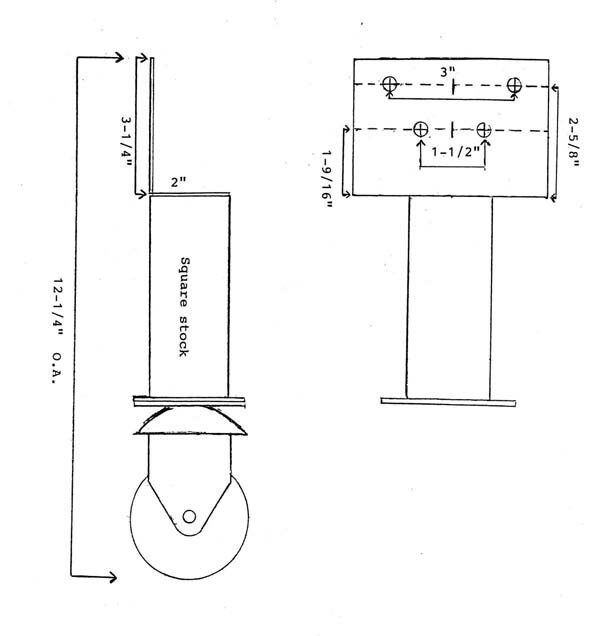 Overall height (12-1/4 inch for the Type 220a/219 sedans) and the face of the angle iron which is bolted to the transmission. (4-3/4" [w] x 3-1/2 [h]). The size of the castoring wheel you use will determine the length of the support column (the "square stock", in my case 4-3/4"). The 1/8" plate was used as a base for the square stock and its area was made to equal the size of the top plate of the castoring wheel. I welded the plate to the wheel first, then to the base of the square stock. The transmission mount bolt pattern measurements are as indicated in the schematic, centered left/right and at the indicated height on the vertical web of the angle iron. Also, the bolt holes are 7/16" diameter and measurements are to the center of the hole. There is not a tremendous amount of weight resting on the castoring wheel assembly and I know that my example is easily three or four times heavier/stronger than need be, however; I tend to err on the side of caution (or paranoia). 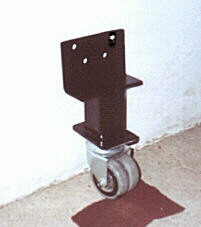 The angle iron, square stock, plate and wheel top plate are all welded as shown in the schematic. I do not know what Mercedes-Benz Ponton models this may be used on other than the Type 220a and 219 sedans with manual transmission because I have never seen the transmission from another model. 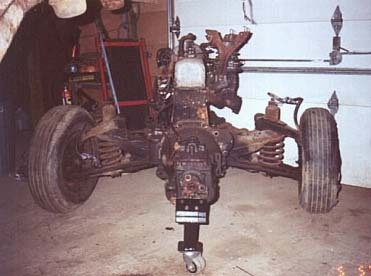 Actual removal of the engine/transmission/sub-frame was completed on May 5, 2002 and was as simple and straight forward as discussed in the manual, with no surprises. 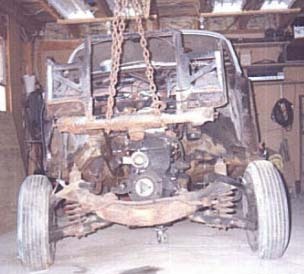 It was also accomplished with only one set of hands and a little "Yankee" ingenuity (a.k.a. "Rube Goldberg" rigging). I hope it goes together as easily — when the time comes.